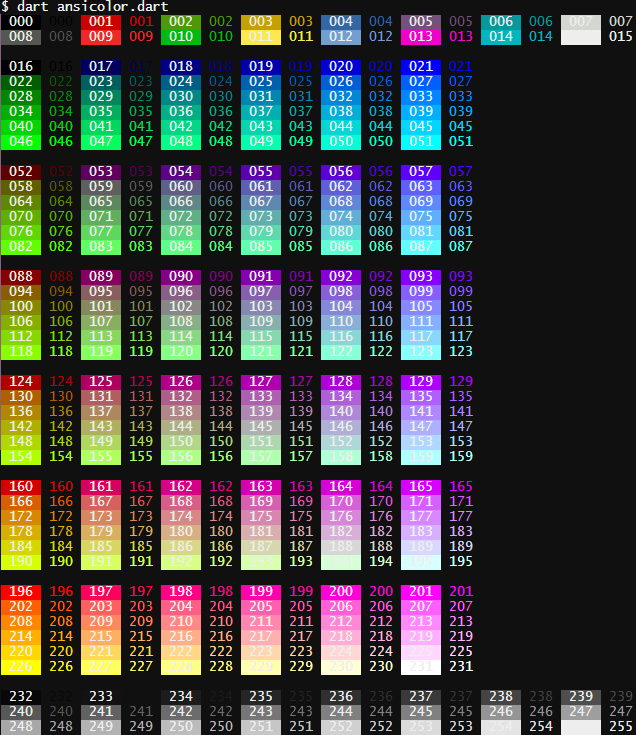 Feel like you're missing some color in your terminal programs? Use AnsiPen to add ANSI color codes to your log messages. Easy to disable for production, just set color_disabled = true and all codes will be empty - no re-writing debug messages. Note: color_disabled is a global variable for all pen colors. Note: Be mindful of contrasting colors. If you set "bright white" foreground and don't adjust the background, you'll have a bad time with lighter terminals. /// Due to missing sprintf(), this is my cheap "%03d". /// Return a reference table for foreground and background colors. No platform restriction found in primary library package:ansicolor/ansicolor.dart. line 56 col 22: Use = to separate a named parameter from its default value. line 56 col 40: Use = to separate a named parameter from its default value. line 57 col 20: Use = to separate a named parameter from its default value. line 57 col 38: Use = to separate a named parameter from its default value. line 58 col 22: Use = to separate a named parameter from its default value. An xterm 256 color support library for making pretty logs.